JON GNAGY MASTER ART STUDIO. Gnagy, a self-taught artist, is fondly remembered by many for his NBC series "You Are An Artist" which aired from 1946 until 1950. As America's original TV art instructor, (yes, before bob!) Jon captivated and inspired generations with his reassurance that anyone could draw a "Ball, cube, cylinder, cone... by using these four shapes, I can draw any picture I want. And so can you!" His simple approach breaks down objects into geometrical shapes, then shows how to build on them for more detailed works of art. 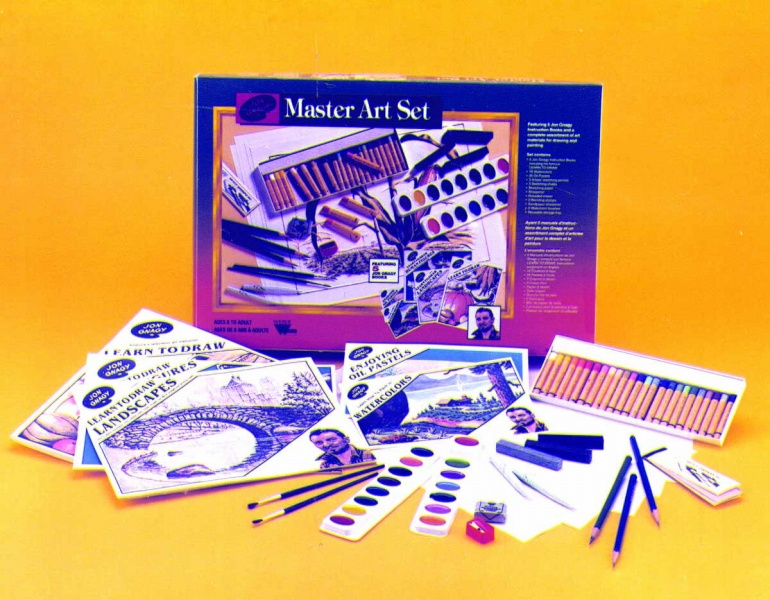 In this super-value art-set, Drawing, Sketching and Oil pastels are all introduced! Jon's superb books and instructional materials will start any interested beginner on the road to success in creative expression. Non-toxic. Ages 8 to Adult! a Real Value Package Designed to Teach in the Master Teacher's Methods!